This verse from the evergreen Himachali song 'Rohru Jaana Meri Ammiye' conveys a message of a child to his mother that he is no longer interested in playing cricket. For all we know, there can be a set of combined reasons behind the child's vow. The fact that he has been hit for a six (six lagaa ho) in combination with the fact that it must have not been easy for the fielder to bring the ball from down the hill. 'Rohru' is a town which is 115 km away from Shimla and some 340-odd km away from Dharamsala. Cricket might not have reached in Rohru, like it has reached in other parts of Himachal Pradesh but it has certainly reached in the winter capital of the state, Dharamsala. International cricket made it's debut in HPCA Stadium, Dharamsala four years ago but it is this moment which will be remembered forever. Be it a debut as a player or as a ground, a test debut is cherished the most on a cricket field. For the development of the game in Himachal Pradesh, a lot of (mostly all of it) credit goes to Lt. Anurag Thakur. Watching international cricket being played in the whites with the exquisite Dhauladhar mountains in the background would be nothing short of a dream come true for him. Canvassing to the game, the series is perfectly poised at 1-1 with the last match to start on Saturday. The much anticipated USP of this match would be the nature of the wicket. The 22-yards are expected to have a decent covering of grass, for it will in meld with the weather suit the fast bowlers, which was not the case in Pune, Bengaluru or Ranchi. With the change in the conditions, a change in the first eleven of both the teams is also contemplated. The mutual confusion for both the team managements would be the inclusion of the third seamer. If it happens, India will have to play him at the expense of an extra batsman whereas Australia might well drop one out of Nathan Lyon or Steve O'Keefe. a big knock in the ultimate test. It would be surprising but if no grass if left on the track, it will only be because the home team wants a win more desperately than the visiting team. Talking of the fast bowlers, Bhuvneshwar Kumar is the most suited bowler for India in such conditions. The small stands of the stadium allow rapid flow of air in the ground which generally helps the fast bowlers in gaining lateral movement. However, Bhuvneshwar should consider himself unlucky if Mohammad Shami is picked over him. Shami has fully recovered from his injury but whether he has attained fitness to survive five days of a test match is still a question for the team management. If Shami is to be included, he can also take Ishant Sharma's place. Ishant might have bowled well throughout the three test matches but three wickets in three matches depict a different story about his bowling. Jackson Bird's consistent line and length in the warm-up game vs India A could not earn him a spot in the final eleven. Conditions in Dharamsala might help his case as well. Both the teams amassed runs in Ranchi, so any major shuffle in the batting department in highly unlikely. Down on his luck, Usman Khawaja might have to return back to Australia without playing a game. 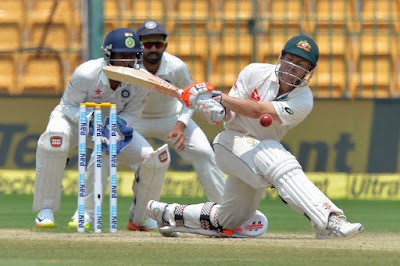 The sameness with respect to both the teams can be derived in the form of Virat Kohli and David Warner. Kohli has managed to score 46 runs in three matches at a paltry average of 9.20. Warner has better numbers (131 runs at an average of 21.86) as compared to Kohli but has still not performed to the level expected of him. Both the big guns are due for a big knock in the ultimate test. With Shreyas Iyer being called in as cover for Kohli, whether Kohli will feature in the final eleven is subjected to his fitness now. To regain the Border-Gavaskar Trophy, India will look for nothing but a victory. On the other hand, a draw will also act as a victory for Australia (current winners). It is for the first time in this season that India are going into the last test of a series without a hand on the trophy. A home season which has lasted for 12 test matches is all set to witness its last test with dissimilar conditions (possibly). Whatever be the outcome, a test match in the lap of Himalayas will be enthralling to watch!